This is by far the most difficult blog I have had to write. I must also say it has taken a bit of time to absorb the scope of what the winter storms brought our way and only time heals to allow me to be able to put it in writing. Erickson Ranch experienced a disaster the winter of 2017 like nothing we have ever seen. As we all know, in northern California, the rains in February of this past winter created havoc for everyone. The seemingly never-ending rain brought flood waters that have not been witnessed for years. 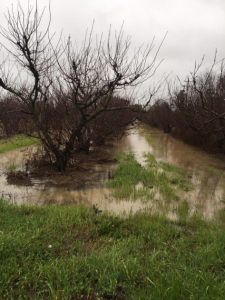 A combination of events at 2482 Cordelia Road created the compromise of our levee with a 40-foot break. Ray awakened at 3 am to torrential rains the morning of February 8th. The water was up to the bottom step of our home and, though it was pitch black outside, the sound of rushing water, as well as three feet of flowing water past our home and into the out-buildings, made it clear to him this was no ordinary winter storm. He said to me, “It is flooding outside.” It had flooded in the past, and as I was on the way to work, I figured it would subside at days end. Little did we know the scope of the disaster. As the light of day appeared the horrid reality of what had occurred the night before became terribly clear. With any disaster brought upon us from Mother Nature, the human being is often helpless and must wait until the damage has completed its course, to be able to collect themselves and move forward. It is ever so difficult to explain our disaster and never has the saying, “A picture is worth a thousand words”, been more appropriate. 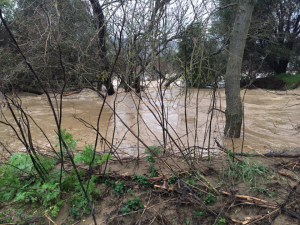 As the river, created by the levee break, flowed thunderously throughout orchards and fields with 3 feet of silt and debris laden rushing water it not only compromised our trees but also destroyed homes on Thomasson Lane beyond our property. My heart and soul ached for the destruction the flood waters brought upon on our close neighbors. As I mentioned earlier, a combination of events caused this catastrophe. 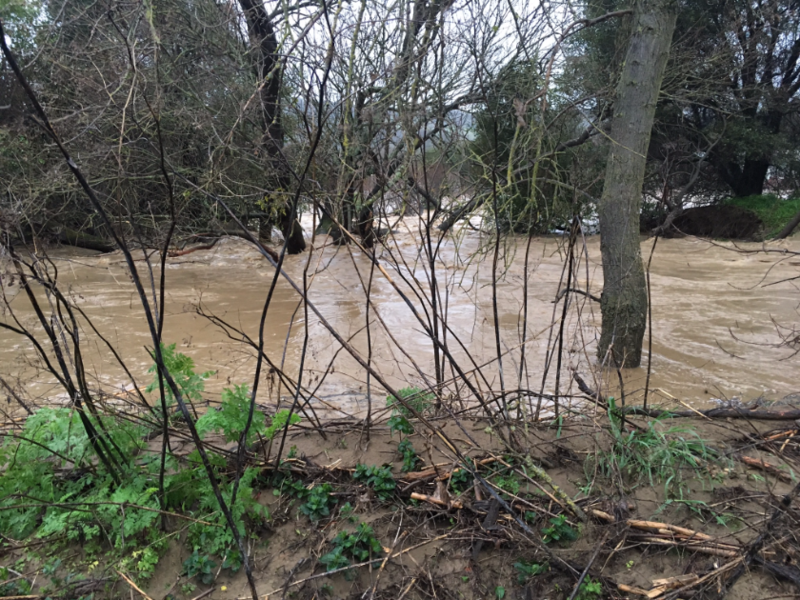 The continual torrential rains, the inability of the land owner to be allowed to clear their streams as a preventative measure for flooding, and the clearing of the creek north of us as it flooded Hwy 80 sending the debris downstream Suisun Creek which flows past the Ranch. Due to the extreme rains, numerous large trees fell across the creek creating the beginning of a dam. The destruction is like nothing we have ever witnessed on our property. The amount of debris left from the flooding water consisted of enormous trees, boulders, and silt that was 3 feet thick when the rain subsided. In the past, people often discarded unwanted items in the creeks. With the torrential power of the flood, we were amazed at the number of delicate, intact bottles we found. As the ranch is going on 4 generations, we will add the new bottles to our historic collection. Our small flooded community came together to determine which direction to go. All were in shock but pulled together to form a plan. Many thanks go to newly elected District Supervisor, Monica Brown, for being the glue that helped us stick together at a very difficult time. 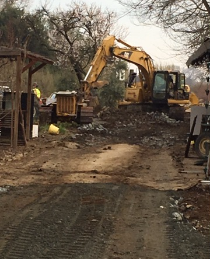 She listened to our pleas of help and corralled the Solano County, Solano County Water Agency and Kinder-Morgan together to repair the broken levee and open the dam allowing Suisun Creek to flow again. The levee is the responsibility of the landowner property, and therefore to be repaired by that owner. We found it interesting that the creek on our property is not our responsibility but the levee is. Years ago the landowner cleared the creek to prevent the exact disaster that occurred in the winter of 2017, but due to the powers that be, the landowner is no longer allowed to clear their creek. Due to the inability to take “responsibility” for our creek, and the tremendous rainfall this year, we were headed for a disaster and it certainly found us. Erickson Ranch once again cannot thank Monica Brown enough, Superintendent for Solano County, for bringing us up from disaster. As farmers, there is no choice but to look forward to the upcoming season and make the best of a terrible situation. Due to the continued rain and the extended time it took for the fields to dry, the ability to work up the land was delayed. Tomatoes and peppers are in though a bit late. Due to the wet spring, spraying of the fruit trees was also hampered. Needless to say, we lost many fruit trees as they don’t like their “feet” wet for too long as it prevents root growth and the uptake of nutrients necessary for growth and fruit production. Jump forward to opening day June 17th,2017. Opening with our Blenheim Apricots and jam. Though our crop of Blenheim’s was by far smaller than usual, they certainly did not lack flavor. Many thanks to our lovely customers for having faith and making the start of this rough season well worth it. This is by far the most difficult season we have had to learn to accept and move forward. As a small, four generation family farm, we must look at what the future holds for us in the state of California, and how we can continue to survive. The process continues. Be well assured that we will always have jams for tasting and to purchase every weekend. To make a purchase of jams online visit www.ericksonranch.com/store. We do several events outside the ranch during the season with jam tasting and sales. Be sure to visit our website, www.ericksonranch.com for a list of upcoming events. Once again, we cannot thank our customers enough for supporting us through “good times and bad”. That is the motto of having a boss like Mother Nature. She determines what direction we go. Thank you so much for sharing your story, and for persevering through this disaster so that we customers will still get to enjoy your wonderful produce and the unique experience of an old-fashioned family Farm. What a great place to bring kids to see how food is grown, meet actual farmers, and taste how good food is when it is picked ripe and eaten immediately. That is becoming a lost art, and you are preserving it, along with your jams! Thank you for sharing your heartfelt story. We admire your tenacity and applaud you for moving forward under such devasting circumstances. Farmers and Mother Nature don’t always work together. She can be a blessing, but she can also wreak havoc as experienced this past winter. Folks need to learn and try to understand all that is involved in getting that agricultural product to the store or fruit stand or farmers market for them to purchase and enjoy. On the farmer. With all that they claim is so hazardous today it makes you wonder how we have survived all these years! We wish you all the best. Your history (4th generation) in the valley is highly respected by so many! Thank You for the wonderful, tender return of support from those that are involved in the business of agriculture. Yes Mother Nature and us are at odds but that is the life of farming. I am so sorry to hear of this, Victoria, and wish you all the best. I still snag one of your jam pots every time I’m out in the Valley! We are sorry to hear of your misfortunes. Best of luck going forward. It sounds like you people have what it takes to persevere. We will see you in October for the annual Downing/Steffen pumpkin picnic. Thank You for your support and we will persevere. Looking forward to seeing you all in October as it is part of our Autumn celebration. I can sense your strong spirit to recover and appreciate sharing your story. You, Ray, and the farm are icons of a sweeter life style that few have experienced. I do love walking your rows of trees and produce and yakking with Ray about astrology and the universe. I love your jellies and flowers. Heal, grow, prosper. Thank You my long time friend. Your comments about your experience with the Ranch are so kind and I can’t thank you enough. We will heal, grow and prosper. Changing for the future is the nature of a family owned business. Words from a good friend mean more than you know. We will persevere. I had no idea you were so affected. Having grown up in a farming community I know that you guys did what farmers do, you kept moving forward. I will be out for peaches soon. Thank You for your kind words. The support from friends is so helpful.  I send my sincere thanks to the family for all the delicious fruits and fresh vegetables as well as the homemade jams I have been fortunate enough to enjoy from Ericksons. I always enthusiastically look forward my visits – its a magical place and I look forward to future visits both in person and online. Thank you for taking the time to let every know. I had no idea of the extent of damage. I saw the mud and debris in the barn next to the house and on the road that leads south towards the fields and the tracks. I am glad things are back in order. Looking forward to getting some peaches. I live at the south end of the Bay Area and discovered your farm many years ago. I have been stopping every summer and fall when driving to Tahoe for your wonderful peppers, peaches, melons, and all your wonderful produce. I am so sorry to read of the disaster that last winter caused on your farm. However, with generations of farmers behind you, I am so proud that you persevered in cleaning up and moving ahead and are now open for business. I look forward to stopping by soon. What a terrifying story. Yes you are correct Irma farming is so very difficult and at time so risky. Thank You for your story.